Hi, I'm new to design. 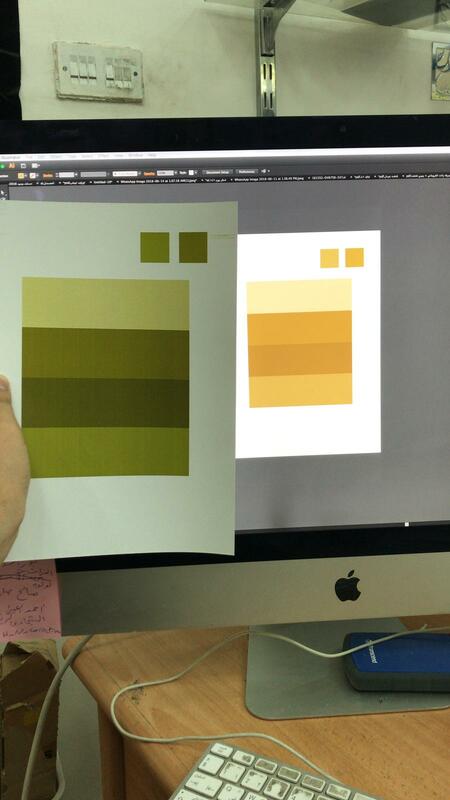 Can you tell me what is the problem that makes my printout color so much different from the file. The "white" appearance of the print has the characteristic hue that results from industrial (inexpensive) fluorescent tube lighting. Under this kind of lighting colours don't appear correctly as the "spectral emission distribution" is not continuous and many wavelengths necessary for correct colour rendition are missing altogether. Such lighting has a poor colour rendering index (CRI). The correct CRI for evaluating colour is 100. Minimum necessary CRI is approximately 91-92 for average studio work. Working with colour requires professionals to use 100 without compromise. The "white" appearance of the display has the characteristic hue that results from the same white point match with the digital camera sensor you used to take the photograph. Most likely, that is for daylight lighting with a correlated colour temperature around 6500°K (Kelvin). They don't appear to match ! ! ! They don't match because each of them are being illuminated differently. The print is being illuminated by the room illumination. The display is being illuminated by a LED display. When you set-up your working conditions according to a known procedure using proper equipment, the display will appear to match the print. It will be so close, you can bet folding-money on its accuracy. This "bet" is referred to in the graphics industry as a "contract proof." The idea is to calibrate your monitor and profile your printer so they can produce a match reliably enough under fixed industry-standard conditions to predict consistent high-quality results by any definition. You can throw money at the problem. Viewing booths having the right illumination and visual isolation along with various colour display calibrators can be purchased and installed. Cost and quality are proportional. Then, calibrate your monitor using the software in your operating system preferences. Set the white-point, gamma, and illumination levels according to the room conditions. Wear neutral-coloured clothing so bright colours reflected from your blouse won't reflect from the monitor affecting your judgement. Profile your printer and scanner using IT-8 target. I assuming you took that photo as an "emergency" proof of your problem on a copy shop. It leads to the second point. The printer is not calibrated. The owner just wants to sell prints and he or she does not care about quality. An equipment should be calibrated with something like Colormunki. Your only option is that you print a series of samples and use them as a reference to that specific machine. Or change to another provider that has a calibrated machine and a clean keyboard. Not the answer you're looking for? Browse other questions tagged adobe-illustrator color color-reproduction color-management or ask your own question. When I export an image from Illustrator, why is it a slightly different color in the exported image? Logo colors look very different on different devices, how to resolve? How to give the bottom half of a shape a different color in Illustrator?